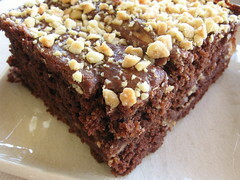 Chocolate-Peanut Butter Birthday Fusion Brownie - Do You Know The Muffin Man? Notes: These brownies were for a special occasion: Happy Birthday M! I made this using Cacao Barry's Tanzanie, a 75% cocoa dark chocolate, instead of the mix of semisweet and unsweetened chocolate called for in the recipe. The brownie contains cocoa powder, a quarter pound of butter, a half pound of chocolate, peanut butter, sour cream and 5 eggs. As if that wasn't enough, a “peanut butter-cream cheese fusion” is swirled into the batter to give a marbled look. Even though there is only two-thirds of a cup of flour, this brownie is not fudgey, but the texture is quite light (whipping the eggs and sugar for 4 minutes probably produced this texture). However, there is no mistaking the rich, deep flavour of chocolate and peanut butter. Well-balanced flavours and very satisfying. Highly recommended.